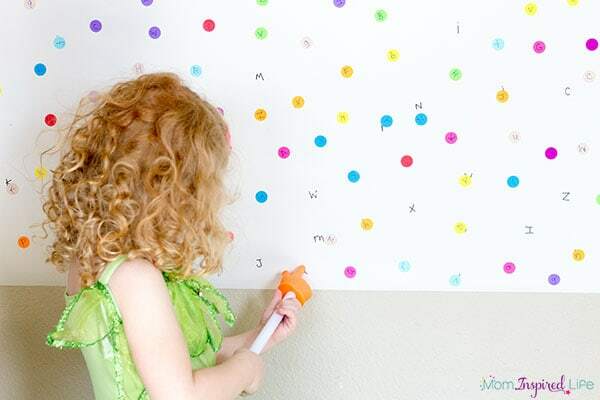 This large-scale letter matching I Spy wall is a super fun way for kids to learn the alphabet and letter sounds while developing visual discrimination skills. I’ve learned that making something really big can be a huge motivator for kids. 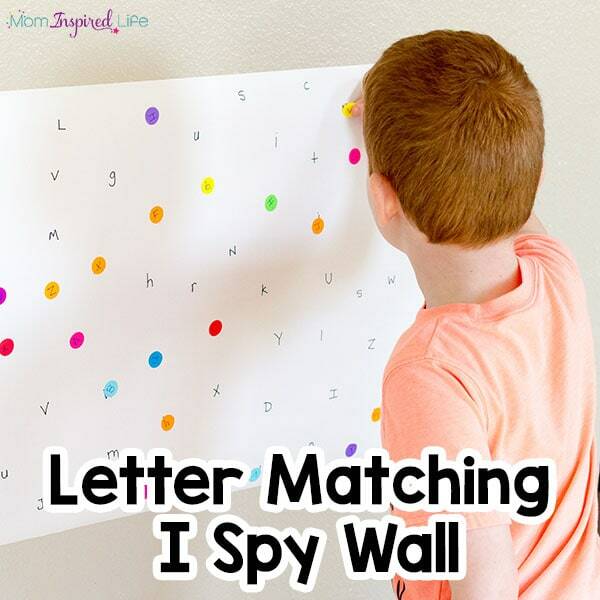 When I made this huge alphabet letter matching I Spy wall, my kids couldn’t have been more thrilled! Check out all of our fun and engaging alphabet activities! There are over 100! 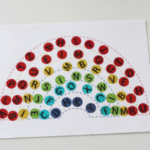 This alphabet activity is very easy to set up and it can be used all at once or over the course of days and even weeks. Even after matching all of the dot stickers to the wall, my kids found other ways to play and learn with it. I was actually quite surprised by how much my kids enjoyed it. 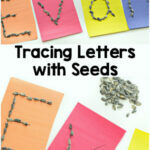 They were highly motivated to find the letters and were very enthusiastic when they did. 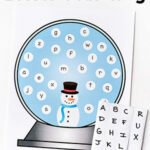 My kids also love this printable alphabet board game! It’s super easy to play and lots of fun! Write letters all over the paper. 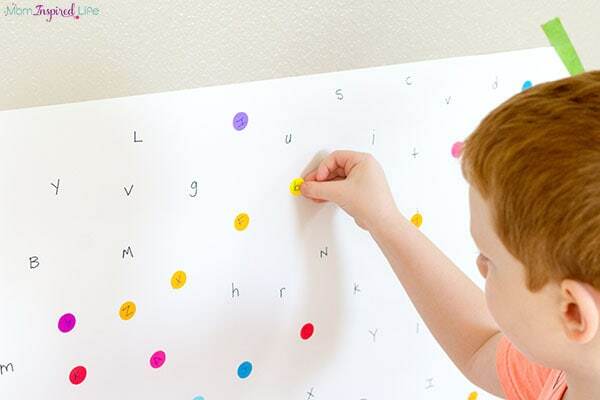 You can make the sheet as long or as short as you want and use any letters you want. I did all of the letters A-Z and repeated them about 6 or 7 times. Make sure you keep track because you will want to make sure you have enough stickers to cover them all. Then repeat those letters on the dot stickers. I wrote lowercase and uppercase letters on the paper. And also lowercase and uppercase on the dot stickers. This way my three-year old could match letters that were the same case while my five-year old could match uppercase letters to lowercase letters. Do this however you like. 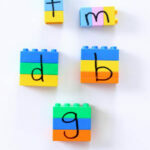 If your child is just learning letters, I would recommend having them match uppercase to uppercase. Tape the large, letter covered paper to the wall. 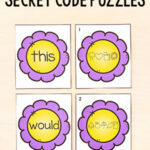 Then give the kids the dot sticker sheets and let them go to town looking for letters! I wasn’t sure how my kids would feel about this activity, but was very pleasantly surprised by their excitement. 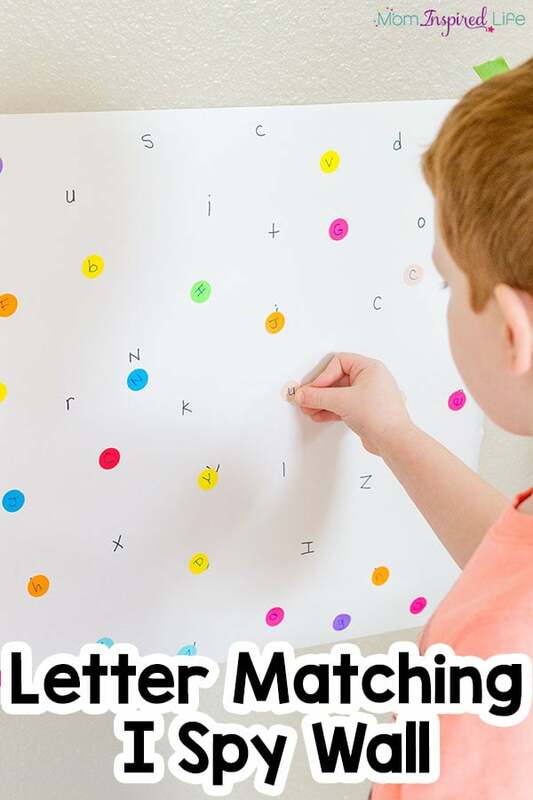 They would grab a dot sticker letter and search all over the paper to find its match. And when they found the letter they were looking for they would get so excited. 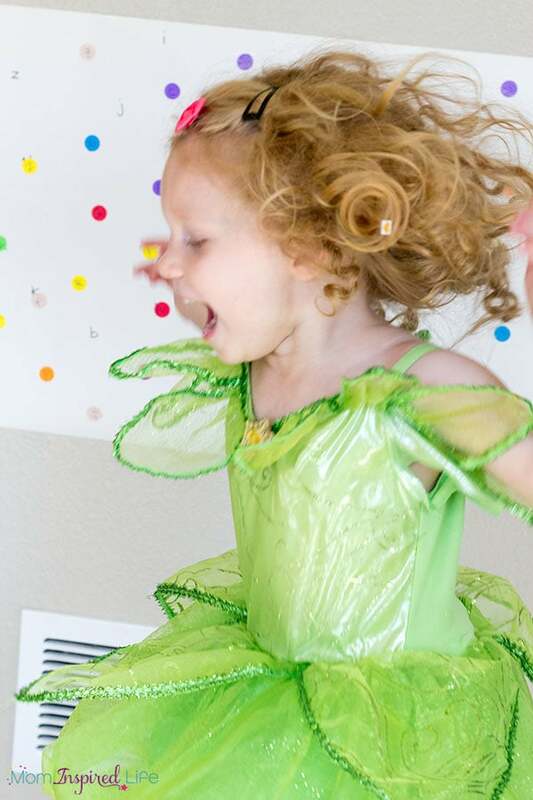 My three-year old would even jump up and down and cheer. It was way too cute! I figured that this activity would last for a few days since I put so many letters on the paper, but they were so into it that they did it all in one day! I figured that would be the end of this alphabet activity, but they found other ways to use it too. After they had matched all of the stickers, they started using it as an alphabet I spy wall. One of them would call out a letter and the other would search for it on the wall. Eventually, it turned into a race in which I would call out a letter and they would both rush to find it on the wall. We gave the three-year old a little help with this version since her brother knows all of the letters and she is just beginning to learn them. Another way I used this with my five-year old was to call out a letter sound and have him look for the letter that makes that sound. Or I would call out a letter and he would find it and tell me the sound it makes. As you can see, there are so many ways to use this letter matching I Spy for play and learning! How would you use it? I would love for you to share your ideas in the comments. 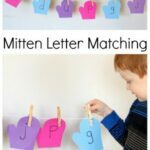 Check out these other related alphabet activities!